Have you noticed a theme for this month yet? Yep, it’s all about the Crock Pot in January, folks. I just can’t think of a better month for a small kitchen appliance to do all the work for you, and you can come home to delicious, healthy food. That is WINNING! And speaking of winning, this is such a yummy chili — jam packed with flavor — but not too spicy for the kids. My kids call this “a burrito in a bowl” and it’s really the best description I can think of. 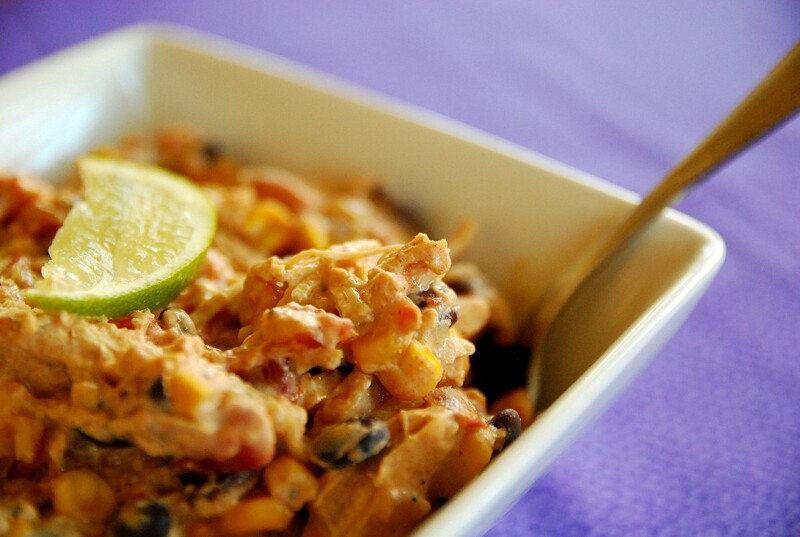 Tender chicken, black beans, corn, onions and garlic — all wrapped up in a tangy sauce. You’d never know the secret ingredient is ranch dressing mix! I typically hate crock pot recipes that ask you to brown something first. Who needs that extra step? I’ve tried skipping it in this one and it turns out fine, but I can definitely tell the difference when I take the extra five minutes to brown the onions and garlic first. You decide if it’s worth it for you. In a large skillet – heat oil and cook onions for 8 minutes than add garlic and cook for one minute. Set your crock pot to low and add chicken, cooked onions and garlic, black beans, corn, rotel, all the seasonings, ranch mix. Stir to combine. Add cream cheese on top and cover and cook on low for 4 hours. Before serving shred chicken using two forks.